Spread across 2,500 sq ft, the Sri Sai Kanchi Shubham store, opened in Hyderabad a few months back, brings traditional South Indian culture under the spotlight. The store is designed to showcase traditionally woven Kanchipuram and Banaras sarees inspired from South Indian culture and it’s a culture in which tradition, art and religious beliefs are inextricably linked and reflected in exquisite temple architecture. The Sri Kanchi Shubham store is a tribute to this. 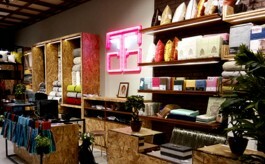 Designed by Bangalore-based company, Four Dimensions Retail Design, the store has been built at a cost of Rs 2,500 per sq ft. The South Indian ethos is manifested right at the store front with a strong visual cue of the saree weaving art interpreted in classy subtle forms but with a modern tech twist. The composite aluminium clad store front is made to resemble a festive saree sprinkled with saree ‘bhutta’ patterns and a temple motif embedded saree border pattern that is edge-lit with color changing kinetic lighting. The signage is made of brushed and edge-lit brass letters, which lends an elegant and luxurious look. The carved main door inspired from traditional temple ‘Garbagudi’ door design and embellished with ornate brass knobs leads into a carved wooden trellis that separates the two main zones of the store – the Lounge Zone and the Service Zone. The Lounge Zone, architecturally designed to look more traditional, is replete with vintage temple elements, sofas and chandelier lighting. The flooring has a combination of terracotta tiles and traditional motifs inlays. Also, a variety of iconic props that represent a distinct lifestyle adorn one part of the wall area. Crafted classic samples of woven sarees are specially framed and presented in the area. The Service Zone on the other hand has a more unconventional feel, with a very modern interpretation of the temple architectural language. It is interpreted and translated into wireframe sculptures using reinforced concrete steel bars finished in copper metal enveloped on stone finish columns and the ceiling. Closed ceiling feature patterns give the impression of slabs from temple interiors. The flooring complements the design narrative with the use of traditional ‘sadarali’ stone slabs that are typically used in temples. The saree display area is full of free-standing traditional wooden wardrobes, padded counters and service seating, conveying the tone of a richly vintage Indian home. Carvings and inlays in the furniture and specially woven upholstery fabric help narrate the story of the brand in a vibrant manner. Additionally, the ceiling highlights are created in the saree selling counter in the form of ‘silk saree light troughs’ that have ‘temple bell’ shaped brass pendent light fixtures. The visual merchandising in the store has played an important role in adding credibility to the brand story telling with installations, props and traditional textile art from South Indian temples. Black and white ‘vintage style’ imagery borrowed from the temple heritage is used to reiterate the product features and brand highlights. The store lighting concept is designed to make the saree buying experience a very special one by ensuring a rich rendition of the product color palette with sharp 1500 Lux intensity. Ornate chandeliers, with flame impression lamps, enhance the overall ambience and store character. Started a few months back, the Sri Sai Kanchi Shubham store is reportedly doing sales worth Rs 60 lakh per month, which is expected to get even better in the coming months. 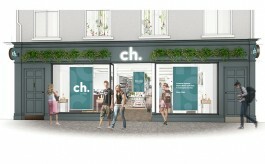 The retail brand is planning to open two more stores, one in Vijayawada and another one in Hyderabad. Explaining it further, he added, “Besides, if you take the flooring pink ‘sadarahalli’ kind of granite, which is again one of the materials used in South Indian temples with metal inlay, complementing it with traditional and decorative patterned ceramic and terracotta tiles was a challenge as it took time to source the same to add the required authenticity to the whole ambience,” he added. Well, no exciting journey is without its challenges and it looks like the challenges were worth the effort in this case.